For many of us, the topic of work brings up thoughts of an arduous commute, a way to support a family and pay the bills, or how much time is left until you can schedule your next vacation. There will always be times when we see our jobs as a means to an end, but if we’re lucky, there will also be transcendent moments when we are part of something bigger than ourselves, when we know that through our labor we are serving a higher purpose. Those are the people whose stories we tell in our latest book, Callings: The Purpose and Passion of Work. People who have realized that the work they do is about more than just making a living. First, we hear from two men who spent more than 30 years cleaning up the streets of New York City. Sanitation workers Angelo Bruno and Eddie Nieves (pictured above) spent years as partners on a garbage truck assigned to Manhattan’s West Village. They were beloved by the locals who would shower them with sandwiches, coffee, and friendship. Soon after Angelo retired, they came to StoryCorps to share their definition of a job well done. Barbara Moore (pictured in the player above) was a bricklayer in Baltimore, Maryland, for more than 40 years. Her masonry work can be seen on many of that city’s landmark buildings including the home of the Baltimore Orioles, Camden Yards. She started hauling bricks when she was 21 years old and weighted just 115 lbs. At the time, Barbara was the only woman in the city doing the job, and at StoryCorps, she told her daughter, Olivia Fite, about how the older bricklayers treated her, and about one who ended up leaving her his tools. The chapters in Callings are divided into themes, and our third story is from “Healers”—doctors, nurses, teachers, and others dedicated to helping. 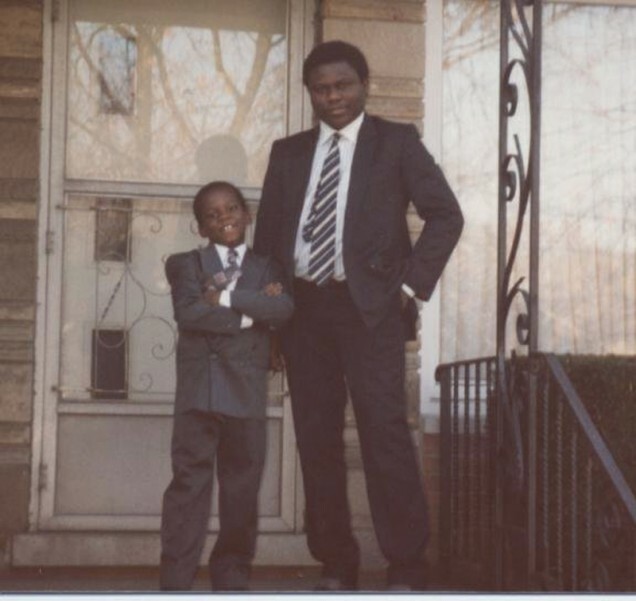 Ayodeji Ogunniyi (pictured above with his father) came to the United States with his family from Nigeria in 1990. He was just a young child when they settled in Chicago where his mother worked as a nurse and his father drove a cab. Ayodeji’s parents worked hard so that he could have a bright future and they pushed him to do well in school so that one day he could pursue a career in medicine. He was on that path—even enrolling in a pre-med program—when tragedy occurred leading him in a new direction toward becoming a teacher. Ayodeji came to StoryCorps to remember his father and the day that changed his life. We wrap up this podcast with a story from the “Dreamers” chapter. 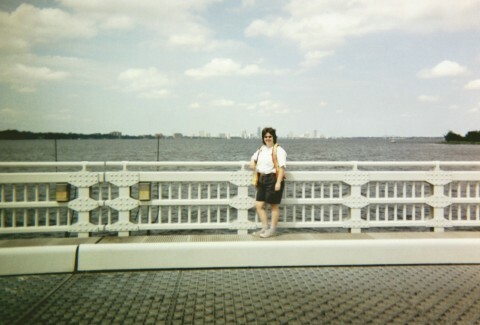 Set in Jacksonville, Florida, on the Ortega River Bridge, Barb Abelhauser (pictured above) left an office job that she hated to begin anew as a bridetender. The job required her to sit inside a tiny booth day after day opening and closing the bridge for boats that needed to pass from one side to the other. At first thinking she would only do the job for a year or so, she soon discovered that despite the poor pay and almost nonexistent benefits, bridgetending was what she was called to do. Click here to check out our CD companion to Callings: The Purpose and Passion of Work. Click here to order Callings: The Purpose and Passion of Work. Michael Garofalo (MG): Welcome to the StoryCorps podcast. I’m Michael Garofalo. In this episode, we’re listening to stories about work. Now, when you think about what it means to go to work, you might think about your commute, paying your bills, your next vacation. There are plenty of times when we look at our jobs this way — as a means to an end. But sometimes, the idea of work becomes much more than that. Sometimes, we get the feeling there’s something that we are called to do with our lives. That’s the subject of the newest StoryCorps book — Callings: The Purpose and Passion of Work. It’s full of stories from people who all share something in common. For them, their work is about much, much more than just making a living. Take Angelo Bruno, for instance. Angelo spent over thirty years as a sanitation worker in New York City. He worked with a partner, Eddie Nieves, and they’d clear over fourteen tons of garbage a day from the city’s streets. 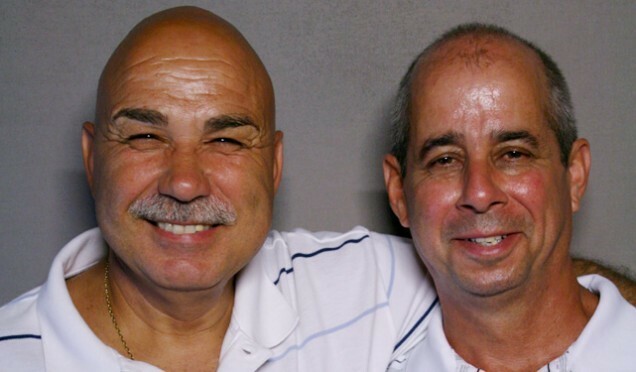 The long-time partners sat down for a StoryCorps conversation shortly after Angelo retired, and they looked back on their days together on the route. Eddie Nieves (EN): Everybody would just come out just to talk to you. EN: And the nuns kissing us, too. We had nuns on our route. You know, I never had that before. AB: (Laughs) The younger guys would ask me, ‘How did you get that?’ It’s just a little good morning, have a nice weekend. Hey, you look great today. I could do 14 tons of garbage, I can’t lift a baby carriage off a step and carry it down? Or hold someone’s baby when they went to get their car? EN: The garbage ain’t going nowhere. You know? The garbage will be there a half hour from now, an hour… so when you get it, you get it. AB: He made a statement one day that he does all the work and I do all the talking. EN: It came out wrong. AB: I’m a little bit of a marshmallow anyway, but I never thought my last day would be so emotional for me. EN: He’s crying. They’re crying. I’m crying watching them cry. And I’ve been very lucky because he’s been the best partner I ever had. We used to try and take the same vacation and try to take the same day off. And I miss my partner. AB: I feel the same way, Eddie. I’ll be honest with you — I miss it terribly, I’m like the little kid looking out the window now when I hear the truck. I think I could have done another 31 years. MG: That’s New York City Sanitation Workers Angelo Bruno and Eddie Nieves. They’re in the new StoryCorps book. And joining me now is someone who was a member of the editorial team and had a huge hand in creating this book, Cailey Cron. Hi, Cailey. Cailey Cron (CC): Hi, Michael. MG: So, I want to ask you about the book, but first can you tell us a little bit about what’s going on with Eddie and Angelo today? ‘Cause this was recorded several years ago. CC: Yes. So, the big news is that Eddie retired just two months ago. And he too had been on the job for over 30 years as Angelo had when he retired. And I talked to him just this past week. He misses the route a lot and really misses all those people that he and Angelo talk about. And in fact, he misses his route so much that he’s planning on biking it this spring, just so that he can say hi to everyone. MG: So, this is a book about people’s work, and there’s, of course, a very famous book called Working, of oral histories, by a giant in the field and one of the godfathers of StoryCorps, Studs Terkel. When you guys set out to make this book, were you hoping to follow in his footsteps or were you trying to do something else? CC: Well, this book was definitely inspired by Studs in part. But Callings is different from his work in a lot of ways. It’s not just about work, it’s not just about people talking about their 9 to 5, and whether they hate it or whether they love it. Callings is really about meaningful work. And that doesn’t mean that it’s just about dream job success stories. The stories in Callings are really varied, and they show that people take a lot of different paths to find meaningful work. And those aren’t always easy paths either. And they’re not always the paths that people expect. There are stories in this book of folks who thought they were on their way to a dream job that turned out not to be a dream job. And on the way, they discovered something else that they loved even more. MG: So let’s listen to another story. It’s Barbara Moore. She was a bricklayer in Baltimore for more than 40 years. She worked on a lot of that city’s landmarks, including Camden Yards where the Orioles play. She started lugging bricks at 21 years old and just 115 pounds. And she was the only woman doing the job in the entire city at that time. Here, she tells her daughter, Olivia Fite, that being a bricklayer wasn’t always the plan. Barbara Moore (BM): Right out of high school I worked in a office, but a couple hours behind a desk and I was falling asleep. So I became a bricklayer. BM: Well it was kind of rough at first ‘cause, you know, a lot of the older guys, didn’t think I should be there and I was taking a job from a man. But I believed that I could do that job. And I was working with this guy Tony Anello, who was a WWII vet, and he had a plate in his head. And he was, you know, really old school guy, but he was willing to work with me when a lot of other people did not want me as their partner. And, uh, when he passed away his daughter called me and said that he wanted to leave me his tools. So that, I think that’s probably – if you’re getting tools from the bricklayers that have gone before you that would be a sign of respect. OF: I noticed that throughout my life people always come up to me on the street and say, “Are you Barbara Moore’s daughter?” There’s a lot of people in this town that have a great respect for you, and you’ve earned that. OF: Well how would you like to be remembered? BM: The only thing that’s important to me, my dear, is that you remember me. OF: But you’ve had your hands in so many things that will last for so much longer than either one of us. BM: I know, I don’t care about that. Whatever I did I was always something that I wanted to do for you. MG: That’s Barbara Moore with her daughter, Olivia Fite, in Baltimore. CC: At one point in this interview, Barbara tells Olivia that when she was pregnant with her, she continued to lay brick up until her eighth month. And at that point, she was experiencing pretty bad morning sickness, but she wasn’t always able to just run down the scaffolding and find a bathroom. The best alternative was the cinderblocks. So, let’s just say that there are surprising and perhaps unintended things inside some of a few Baltimore buildings. MG: That’s pretty gross, but I love it. So, this is the fifth StoryCorps book. And one thing that I’m curious about, because, of course, I do audio, is how do you make one of these things? CC: So, the editorial process for Callings started over two years ago. And once we decided on a broad theme—work—we turned to our archive. So, we were looking through 65,000 stories. And we were able to cull that down to a couple thousand and then a couple hundred and then down to about 150 or so interviews that we transcribed, the full 40-minutes. And then, our wonderful editorial team edited them in print, much like you, as a producer, would edit a story in audio. One thing that’s different though in print is that we have to decide how to translate someone’s voice onto the page. How do we show regional dialects? How do we capture people’s patterns of speech? It’s not just about creating a clean, precise story. It’s about capturing the feel and the personality and putting that onto the page. Each of the final 53 stories, once they’re all together in a book, they’re almost in conversation with each other. There are these common themes that emerge across generations, careers. And it’s a beautiful, beautiful thing to see all these stories together adding up to something more than the sum of their parts. MG: And one thing about the book that listeners should know is that there’s a lot of stuff in there that has never been heard by anyone before. It’s not been on the radio, it was recorded, put in the archive and this is the first time that you’re able to read it, hear it or learn about this person’s story. CC: Yes, almost half of the stories in Callings are entirely new. And even stories that have been broadcast before are different in print. We have a little bit more space to add more backstory and more information, so all of them are new in some way. MG: Now, there’s a section of the book that’s called, “Healers,” and I was wondering if you could explain a little bit what that idea is. CC: Sure, in “Healers,” we have stories from doctors, EMTs, people who are healing the physically sick. And then we also have stories from people who are healing broken systems or communities. Like, a public defender or a teacher. MG: And one of those teachers is actually kind of healing himself through his work also. His name is Ayodeji Ogunniyi. He came to the US from Nigeria with his family in 1990, when he was just a young child. They settled in Chicago, where his mother worked as a nurse and his father drove a cab. And Ayodeji remembers his dad as the kind of person who made sure his son’s homework was done, but snuck him toys and treats when his mother wasn’t looking. Ayodeji’s parents envisioned a really bright future for him. They pushed him to work hard in school and to pursue a career in medicine. And he was on his way to becoming a doctor, enrolled in a pre-med program. But midway through his freshman year, something happened that would set him on an entirely new path. Ayodeji Ogunniyi (AO): Eleven o’clock that night, the knock came. They told us that my father was found in an alley and he was murdered. I remember yelling, ”No,” really loud. And my brother was going haywire and he punched a hole in the wall. And then my mother just…she started to pull her hair and she scratched her face. They found the murderers in four days. They were 18, 19 and 22. I was angry. I was very, very angry. I didn’t want to retaliate. I just wanted to just ask them why. What happens to a person? Where do they get lost to become murderers. There are many people that cry because they’re hurt, they’ve been neglected; but to cry because you couldn’t read. That spoke volumes to me. So we got him in some other programs and he start to read and it just was like this gift that money can’t buy for him. And by me giving that to him, I totally forgot about the pain of the murder, and I wanted to continue to give more of what I had – to heal. It just dawned on me: Everybody at some point sits in a classroom. That could be the foundation for everything else. So that’s when I said that whatever happened to my father is not gonna be in vain. I’m gonna follow my heart and become a teacher. MG: Cailey, you had the chance to talk to Ayodeji while you were working on the book, is that right? CC: Yes, so one of my other roles here is fact-checking, which is something that we do with every story, whether it goes on air or into a book. We really want to make sure that we’re representing people’s stories accurately. And it’s also a way to involve them in the process. So, I call up participants and we go through every line of their story together. And it’s fun, because they get a chance to tell me some stories that didn’t make it into the interview. And they’re also often digging through old photos and paperwork while we’re on the phone together. One of the things that Ayodeji sent me is a questionnaire that he gives to his students on the first day of school. He’s now a full-time English teacher at a high school in a suburb of Chicago. And he’s in a district where nearly a third of kids live below the poverty line. And he puts a lot of effort into getting to know them from Day One. MG: So what are some of the things that he asks them? CC: Questions like, “Do you bring your own lunch to school?” “Who do you know, other than a teacher, who has gone to college?” “Do you have at least one adult that you feel safe with?” And, “What was one thing a teacher did that disappointed you?” From these pretty simple questions, he’s gleaning more information about his students’ lives than they might even realize. MG: So, we’ve got one last story to listen to from Callings. CC: Yes, and it’s from the “Dreamers” section, which is the first section of the book. MG: The story comes from Jacksonville, Florida and the Ortega River Bridge. This drawbridge has been open since 1927, and thousands of people cross it each day, but very few of them ever notice the bridgetender. 24 hours a day, seven days a week, this person sits inside a tiny booth, opening and closing the bridge so that boats can pass through. Barb Abelhauser became a bridgetender there after leaving an office job that she totally hated. And at StoryCorps, she told a friend, John Maycumber, that she thought she’d only work on the bridge for a year, but wound up staying eight. Barb Abelhauser: The pay’s horrible, the benefits are worse, but I have the most gorgeous view in the entire city. I mean, executives who make hundreds of thousands of dollars do not have my view. And I’m getting paid to stop and look. That’s the thing I think I love the most about this. John Maycumber: And you must see a lot of things that the most of us miss. BA: You know, I think about that a lot because I’ve been sitting in the same exact spot for all these years and I see the passage of the seasons. I see the alligator that hangs out below my window and when she lays her eggs I hear baby gators barking. And people don’t even realize we’re there. They’ll walk past us and say the most intimate, private things and we hear them. People go on dates on these bridges and they propose. So you get this little tiny snapshot of people’s personal lives that they don’t even realize that they’re giving you. There was a fisherman that used to come through the bridge every morning like clockwork. I never knew his name. You know, we had a connection but we don’t really know who each other is. And one day he came through and I waved. And I found out in the news that maybe ten minutes later, while he was on his boat heading out to fish, he had a heart attack and passed away. His boat washed up on the shore of the river. He was on the boat alone, and, so, I was the last person that saw him alive. It makes you think. It makes you appreciate. You know, I’ll be out there at 3 o’clock in the morning, there’s no traffic, it’s quiet. And I’ll look up and there’s the moon. And I try to thank the universe once a night for this opportunity. And I think of the fact that I could get hit by a bus tomorrow. And if that happens, I want have woken up that day and not thought, I don’t want to go to work. [Laughs] You know? Most people don’t have that. I love it. CC: Since making this recording, Barb actually moved across the country to Seattle, where she found another job tending bridges. While fact-checking Barb’s story, we talked a lot about that fisherman that she mentions. And the last day that she saw him was so long ago, she didn’t remember what year or even what season, but she really did remember his face, and I think the mystery of his death really weighed on her for a lot of years. They greeted each other every day and even though she didn’t know his name, he felt like a friend to her. MG: So before we go, I’m curious, what did you learn from working on this book? CC: So working on a book about work and now talking with you about my work on a book of people talking about work has given me a lot of opportunity to reflect on my own work life. But if there’s one thing that I’ve learned from all the stories in this book, it’s that there’s no one right way to find meaning in work. And that’s really reassuring. I might not find my dream job right away, I might stumble across something, a passion of mine years from now. That’s a wonderful thing, to feel like you don’t reach a point in life where you’ve missed the boat. And so, it makes me excited for the rest of my life. MG: Well, Cailey, thanks so much for coming on. CC: Thanks for having me, Michael. MG: That’s all for this episode. These stories were produced by Jasmyn Belcher Morris, Liyna Anwar, and Brian Reed. The podcast is produced by me and Elisheba Ittoop. Special thanks to the cracker jack editorial team who created the new StoryCorps book, Callings: The Purpose and Passion of Work. It was co-authored by StoryCorps founder Dave Isay and Maya Millet. Lizzie Jacobs was the executive editor and, of course, Cailey Cron, jean-of-all-trades, who was the associate editor, fact-checker and did a million other things that we don’t have time to list here. I’d also like to thank David Herman who produced a CD companion to go with the Callings book. It’s two hours of StoryCorps stories, just like the ones you just heard. Find out what music we used in this episode on our website StoryCorps dot org. And don’t forget to let us know what you think of this podcast. Leave a review on iTunes. We really do read them all. I’m Michael Garofalo. Until next time, thanks for listening.